LAS VEGAS – Speculation has been rampant since Dell announced its acquisition of EMC late in 2015 in the biggest business deal in history at $68 billion if the EMC brand would continue after the close of the transaction. 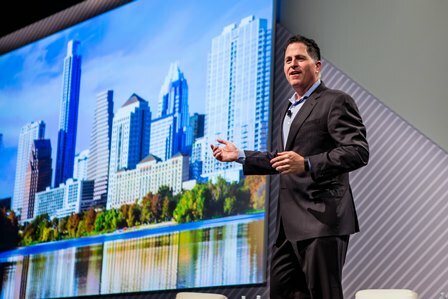 Well Dell CEO Michael Dell put that to rest at the EMC World show by confirming after the close the newly integrated operation will be rebranded Dell Technologies. Dell CEO Michael Dell on stage at EMC World. “What do I call the new company? Well, I believe the acquisition of EMC is a family move and I would like to continue the company as a family. Since I’m partial to my own name it will be called Dell Technologies,” Dell said at the EMCWorld conference. He added that after the deal was announced Dell embarked on a worker study with about 7,500 employees from Dell and EMC to measure culture. Michael Dell revealed that the culture is very similar with the top five traits being the same. The first trait being customer focus, he said. Michael Dell has been consistent in his message ever since the announcement saying that Dell and EMC portfolio are complimentary. But for those partial to the EMC brand; not to worry as it will remain as a sub-brand. The Dell EMC brand will be the new company’s Enterprise business sub-brand; The original “Dell” name will continue to be used for client solutions. Going forward the new Dell Technologies will comprise the combined enterprise infrastructure businesses of Dell and EMC, the PC business and affiliated businesses including VMware, SecureWorks, Pivotal, Virtustream, RSA and VCE. The two brand names coming together could build confusion in the marketplace but David Goulden, the CEO of EMC II does not see it that way. Both Dell and EMC sources have told CDN that the transaction remains on schedule under its original timetable and terms, which is expected to be Oct. 16, 2016. The transaction remains subject to approval by EMC’s shareholders, regulatory clearance (one specific to the China market) in certain other jurisdictions and other customary closing conditions. “The combination of Dell and EMC can be the most trusted provider in IT. Together we can modernize IT and help you for the digital future,” Dell said.